As recently as the turn of the 21st century, roughly half of U.S. teens could expect to spend at least part of their summer vacation lifeguarding, dishing up soft-serve ice cream, selling T-shirts or otherwise working. 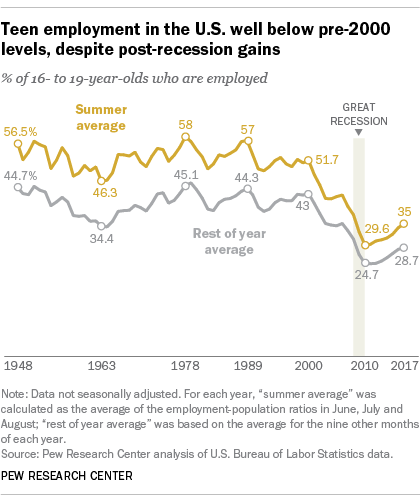 But the share of teens working summer jobs has tumbled since 2000: Despite some recovery since the end of the Great Recession, about a third of teens (35%) had a job last summer. To understand what’s happened to the Great American Summer Job, Pew Research Center looked at the average employment rate (known as the employment-population ratio) for 16- to 19-year-olds in June, July and August. (We used non-seasonally adjusted data from the Bureau of Labor Statistics for this analysis; teen employment rises sharply in the summer months, typically peaking in July.) From the late 1940s, which is as far back as the data go, through the 1980s, teen summer employment followed a fairly regular pattern: rising during economic good times and falling during and after recessions, but generally fluctuating between 46% (the low, in 1963) and 58% (the peak, in 1978). That pattern began to change after the 1990-91 recession, when the teen summer employment rate hovered around 50% for the entire decade of the ’90s. Teen summer employment fell sharply after the 2001 recession, and even more sharply during and after the 2007-09 Great Recession. Only about 30% of teens had jobs in the summers of 2010 and 2011. Since then, the teen summer employment rate has edged higher, reaching 35% last summer, but is still below pre-recession levels. Younger teens – 16- and 17-year-olds – always have been less likely to work in the summer than their older peers. In percentage terms, however, employment for younger teens has increased more than for older ones. Last year’s summer employment rate for 16- and 17-year-olds was 25%, up from 18.5% in 2010. For 18- and 19-year-olds, the summer employment rate last year was 46.4%, compared with 41.6% in 2010. White teens are more likely to work over the summer than teens of other racial and ethnic backgrounds. Last year, for example, the summer employment rate for 16- to 19-year-old whites was 37.3%, versus 29.7% for Hispanics (who are of any race), 26.1% for blacks and 23.3% for Asians. About 1.3 million more teens were employed in July 2017 than in April, a rough gauge of summer jobholding; 954,000 of those additional teen workers, or 74.1%, were white. The decline of summer jobs is a specific instance of the longer-term decline in overall youth employment, a trend that’s also been observed in other advanced economies. Researchers have suggested multiple reasons why fewer young people are working: fewer low-skill, entry-level jobs (such as sales clerks or office assistants) than in decades past; more schools ending in late June and restarting before Labor Day; more students enrolled in high school or college over the summer; more teens doing unpaid community service work as part of their graduation requirements or to burnish their college applications; and more students taking unpaid internships, which the Bureau of Labor Statistics doesn’t count as being employed. 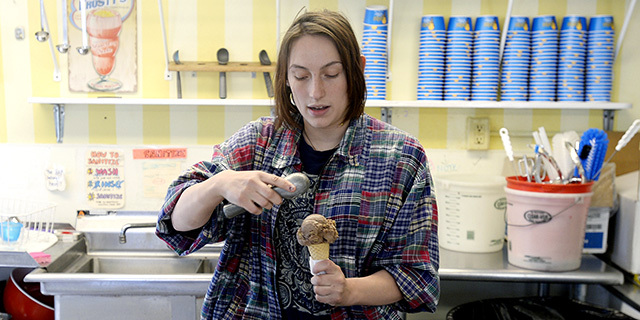 When teens do get summer jobs these days, they’re more likely to be busing tables or tending a grill than staffing a mall boutique or souvenir stand. Nearly 2.1 million of the estimated 6.2 million teens who were employed last July (33.8%) worked in “accommodation and food services” – restaurants, hotels and the like – compared with 1.9 million (22.6%) in July 2000, according to BLS data. 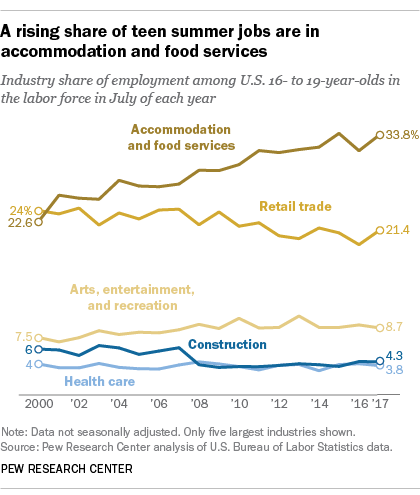 In fact, accommodation and food services was the only major industry that had more teen workers last July than in July 2000 – a span in which the total number of employed 16- to 19-year-olds fell by 2.3 million, or 27.4%. Overall, accommodation and food services added more than 2.3 million workers between July 2000 and July 2017, for a 19.6% growth rate. Retail, on the other hand, has seen a steep falloff in teen summer workers. Last July, just over 1.3 million teens worked in the retail sector, compared with more than 2 million in July 2000 – a 35.3% drop. Retail accounted for 21.4% of teen summer jobs in July 2017, down from 24% in July 2000. Among all workers, by comparison, retail employment was about 4% higher last July than it was in July 2000. Up modestly, at least in percentage terms, was the “arts, entertainment and recreation” sector, which includes such employers as sports teams, museums and other tourist sites, county fairs and performing arts groups. Last July, 8.7% of employed teens worked in that sector, versus 7.5% in July 2000 (though the actual number of teens working in this sector fell by 95,000 over that period). To some extent that reflects broader growth in the sector, which grew by 432,200 workers (19%) over that same period. The construction and manufacturing shares of teen summer employment both have fallen since 2000, to 4.3% and 3.8% respectively. A combined 498,000 teens worked in manufacturing or construction last July, less than half as many as in July 2000 (1.07 million). By comparison, while overall construction employment last July was about where it was in July 2000, total manufacturing payrolls were down about 28%. How do things look for teen employment heading into this summer? As of May, 29.7% of 16- to 19-year-olds, or 4.97 million, were employed (before adjusting for seasonal variations), suggesting that the modest upward trend that began in 2012 still holds. An estimated 737,000 were unemployed, meaning they were available and actively searching for work but had not yet found any; the unemployment rate among 16- to 19-year-olds was 12.9%, not much different from the 12.6% rate recorded in May 2000. But even though there are more working-age teens today than in 2000, far fewer of them are in the labor force: 5.7 million as of last month, down from 8.1 million in May 2000. Last month, around 11 million teens (66% of the total 16-to-19 civilian non-institutional population) were outside the labor force entirely, versus 7.8 million (49.1%) in May 2000.